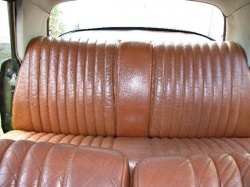 Leather has been used in cars for well over a century. 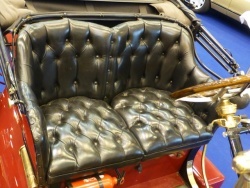 The first motorised vehicles copied the seat cushions and backrests found in horse-drawn carriages, which used to be the main form of transport. At first the covers were made from vegetable tanned leather without surface colouration, then made water repellent with oils and fats, just like saddles. 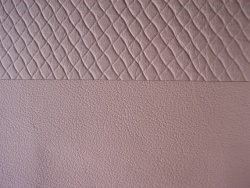 But very soon, the leather got a protective colour layer (pigmentation). 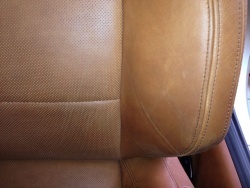 This surface colouration made the leather more resistant to humidity and dirt. 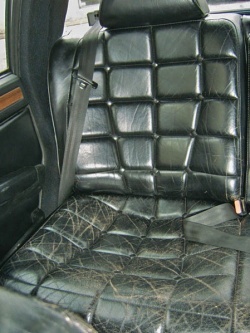 This kind of leather was standard until the 70s and 80s. It can be identified by the brown reverse side. 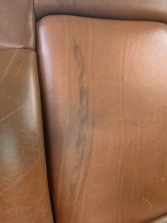 The leather was not dyed through and was slightly firmer. 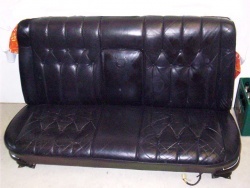 During this time, the English company Connolly was a very famous car leather brand. 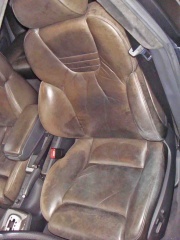 It was a hallmark of high-quality vegetable tanned leather. Sadly, the company no longer exists. 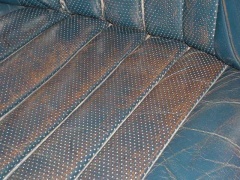 From this period,chrome tanning became a more viable industrial process and very quickly replaced vegetable-tanned leather. 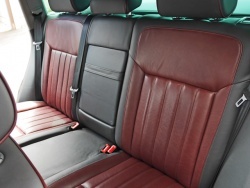 Today, none of the major automotive manufacturers use vegetable-tanned leather. However, there are manufacturers such as Audi, Volkswagen and Porsche who prefer synthetic tanning instead of chrome tanning. 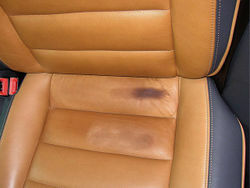 Most experts find it difficult to see the difference between chrome tanned leather and synthetic tanning. The only way to distinguish between the two types, is to examine the leather in the laboratory. 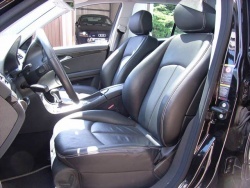 If a vehicle interior is completely covered with leather, it is called a full leather trim. 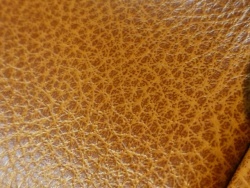 But leather can be combined with lots of other materials. 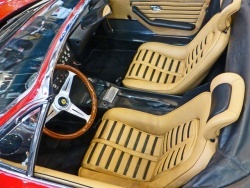 Over the years, leather has featured in car interiors with materials such as alcantara and imitation leather. 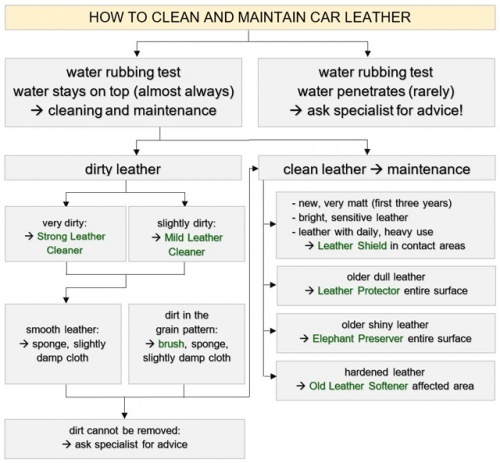 It is important to check which type of leather is included when buying a car. 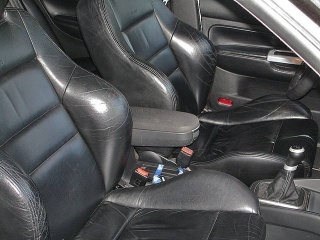 Most customers purchase a car with leather interior in good faith. 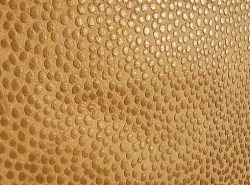 However, the proportion of surfaces processed with synthetic leather is steadily increasing, even in luxury brands. 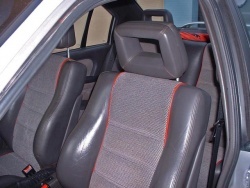 Synthetic leathers look identical to pure leather surfaces, which is why customers should always check whether headrests, rear bench door panels, back of the seats are made from real leather. 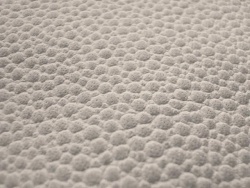 In most cases, even the sales personnel do not know which surface is covered with which material. 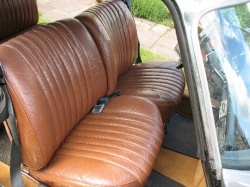 Also more and more car interior surfaces are processed with split leather. 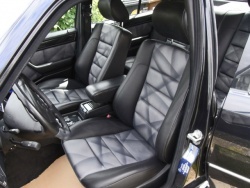 Since even the expensive vehicles are now often partly processed with artificial leather or split leather, customers should always ask. If uncertainties remain, full details can always be obtained in the purchase contract. 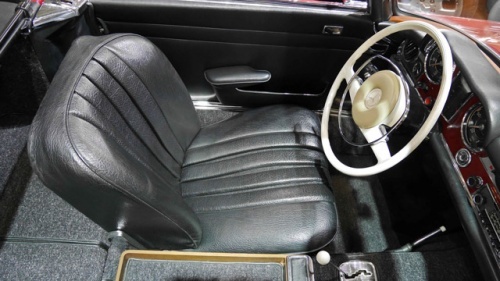 Many buyers would be surprised how little surfaces of the "Leather Interior" are actually covered with high quality grain leather. 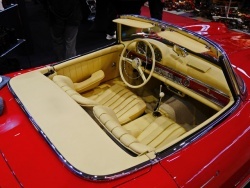 Vintage car with metallic leather. 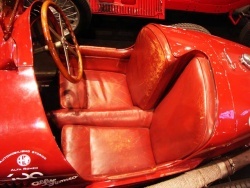 - Vintage car with leather patina. 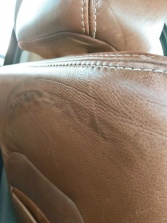 The automotive industry checks the quality of the leather very rigorously. 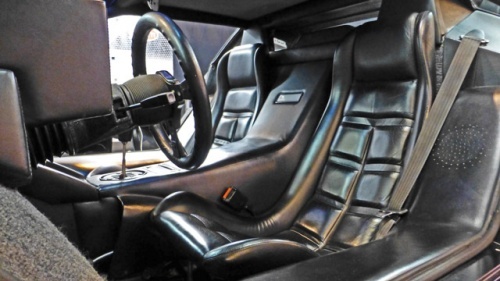 There are an infinite number of parameters to be fulfilled by a modern automotive leather. Every manufacturer has their own testing standards. Typical parameters of the tests: light fastness, rub fastness (dry / wet / alkaline), bending fatigue behaviour, colour adhesion, tear strength, vapour permeability, flammability, hydrolysis, haptic, climate change test, gloss degree, soiling, smell, squeak behaviour and fogging. 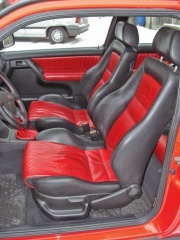 Because of these rigorous testing standards car leathers are very uniform. 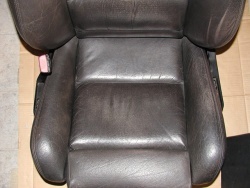 It is almost always single colour, surface-coloured smooth leather. This insensitivity affects the haptic. 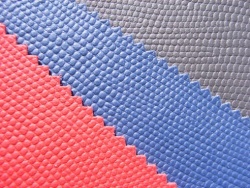 The best overview of the various leather colours of the different manufacturers can be found at LEDERZENTRUM. 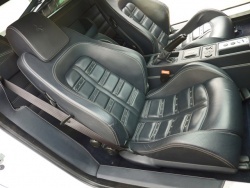 Even though most car leathers are very uniform, there are some exceptions among some manufacturers. Below you can see these features. The following description is not complete! You are welcome to send us pictures and information. 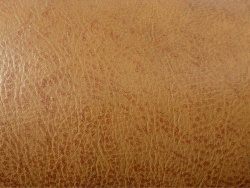 The best overview of the different leather colours of the manufacturer can be found at www.colourlock.com. 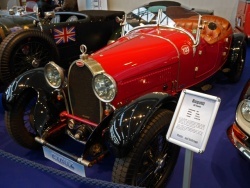 The changing times at Alfa Romeo. But always in "rosso". 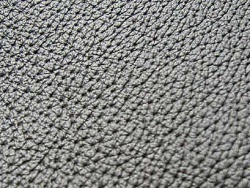 Leather used in Audi is free of Chrome, synthetic tanned and finished free of solvents. VW & Porsche have adopted a similar approach. 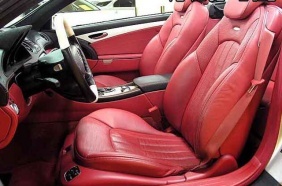 Audi offers different types of leather: Buffalino, Chricket, Kodiak, Milano, Napa Leather, Fine Napa, Pearl Napa, Silk Napa, Valcona, Velvet, Vienna, Volterra. 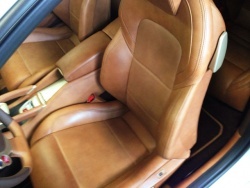 The porous aniline leather in the RS6 is a rare exception. 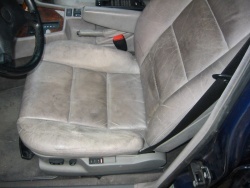 Porous leather is very sensitive and therefore rarely processed in cars. Very old Bentley with leather straps. Bentley S 1 from 1958. 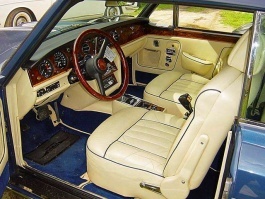 Bentley Continental from 1997. Import from USA to Europe. 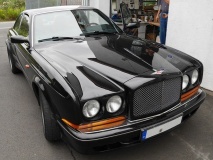 Bentley Continental T Widebody from 1997. 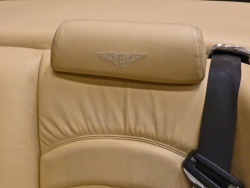 Bentley Azure from 2000 with embroidery and creases. 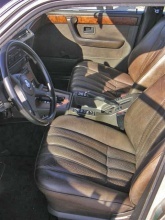 BMWs types of leather: Bison (embossed, not the same as Buffalo leather from BMW), BMW Buffalo Leather (real water buffalo leather, originally open pore, later with pigmented leather finish), Cinghalino (embossed pig skin optics), Dakota (embossed), Kansas, Lavalina (Alpina), Merino, Montana (embossed), Monza, BMW Napa, Nasca and Vernasca (embossed), Nevada, Novillo, Oregon, Pearl, Walknappa (napa). BMW is the brand with the most diverse embossments. 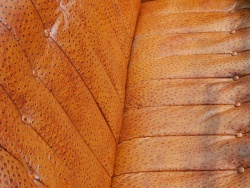 Cow hide grain texture "Bison", "Dakota", "Kansas", "Klassik", "Merino", "Montana", "Nappa", "Nasca", "High Leather"
BMW Buffalo leather (water buffalo leather). Typical is fading and sensitivity to staining. 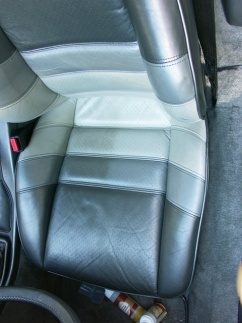 In the last picture is a pigmented BMW Buffalo leather. 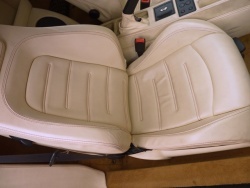 BMW Buffalo leather (water buffalo leather) in a M6 635 CSI from 1985. 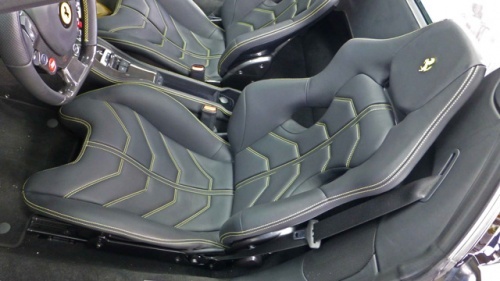 Z1 seat with nubuck and smooth leather "Camouflage". 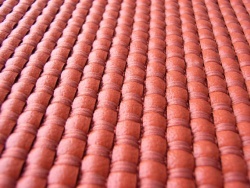 Another special feature: A cover of a mix of fabric strips and leather strips. 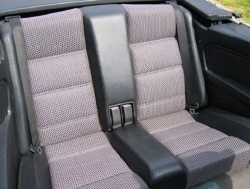 The grey cover comes from an E30 Convertible from 1991. 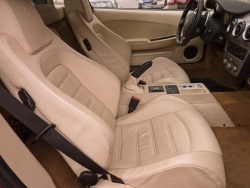 BMW E28 M5 from 1986 with a full leather trim. Even the roof lining is made of nubuck. 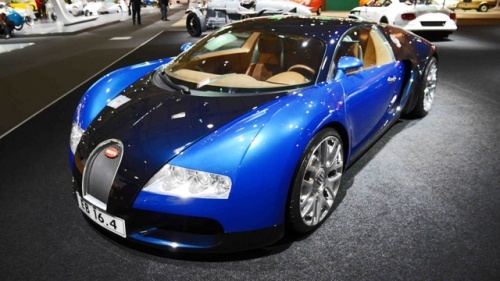 A Bugatti was always extravagant, whether ancient or modern. 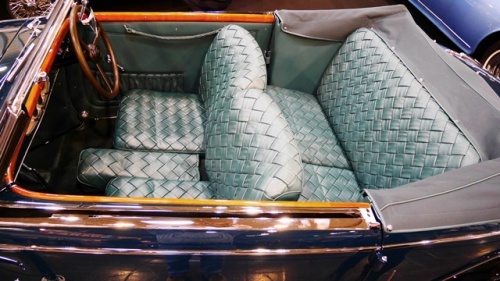 Bugatti 38 Tourer from 1927, curiously with synthetic leather with ostrich leather embossing. 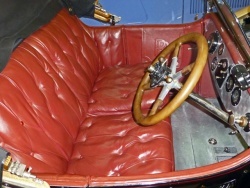 The Bugatti Type 46 Coupé Superprofilée is also called “La Petite Royale”. 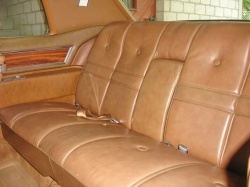 Real ostrich leather and walnut wood. 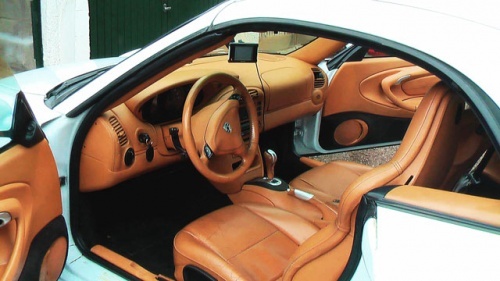 The Bugatti Veyron costs more than € 1 million, whether with napa leather or in combination with nubuck and aniline leather (right). Commonly found in America. Playful yet luxurious. 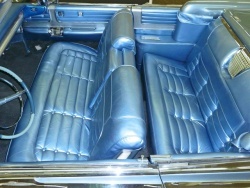 Picture 1: Cadillac Fleetwood from 1963. 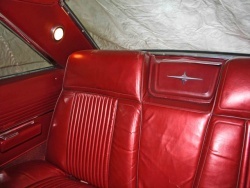 - Picture 2: Cadillac from 1972 with slightly two-tone leather. 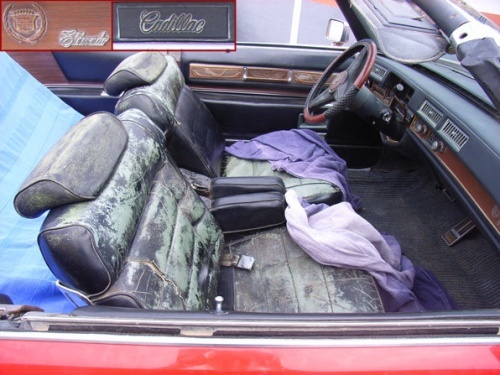 - Picture 3: Cadillac Eldorado with plenty of patina. 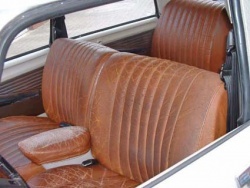 The seats of Chevrolet Corvette upholstered with imitation leather Imitation leather was a new product and clearly very trendy. 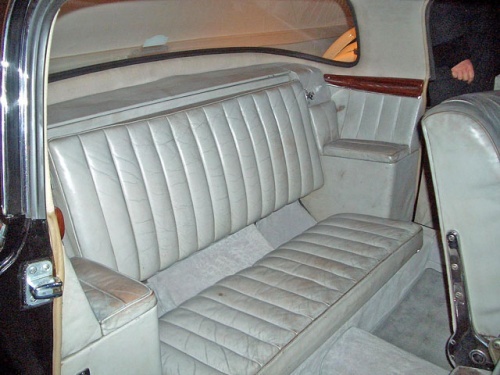 Left: Chevrolet Caprice Coupe from 1979. 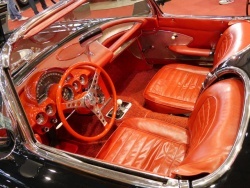 - Right: Corvette C1 from 1959. 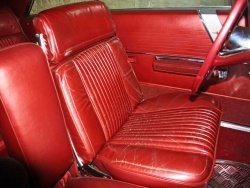 American cars with leather interiors are more colourful. 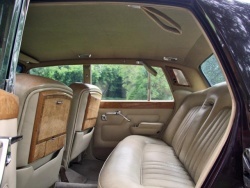 Chrysler 300 from 1966 with a shining metallic leather. Citroën also has its own creations. 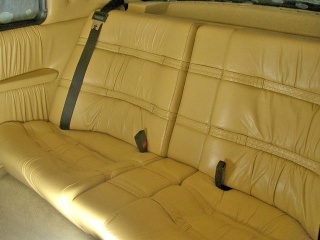 Picture 1: Citroën CX Prestige Turbo 2 from 1988. 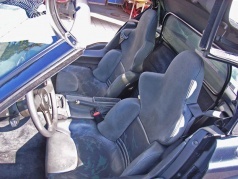 - Picture 2: Citroën CX (year of construction is unknown). 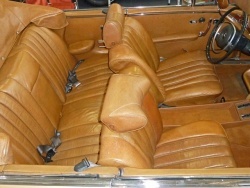 Picture 1 to 3: Citroën DS from 1968. 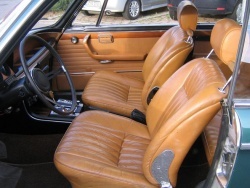 - Picture 4: Citroën DS from 1972. 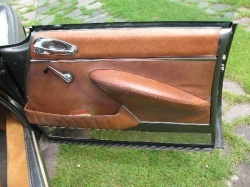 The Citroën DS often has two-tone brown leather. 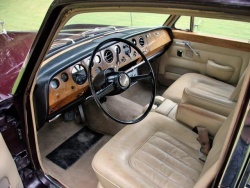 It's comparable with the "Nature Antique" or "cognac two-tone" from Mercedes. 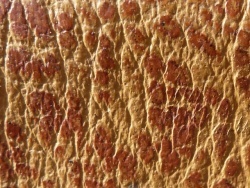 The background of the leather has a lighter medium brown, and in the foreground are reddish brown dots. Often one notices this only upon a closer inspection. 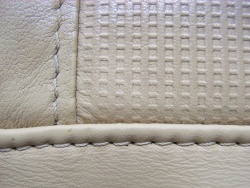 Making colour corrections and repairs of leather with these characteristics must be carried out with extreme care. 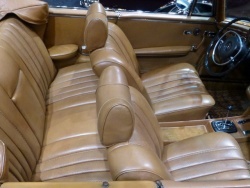 Two-tone leather in the DS. 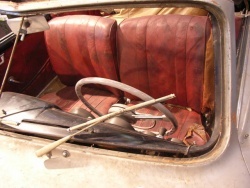 Left: Citroën DS 21 Décapotable from 1966. 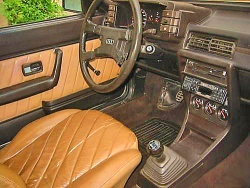 - Right: Same model with the characteristic steering wheel. Other countries - other seats. The Italian style. 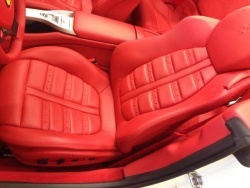 The ribs in the seats is the style element of Daytona seats from Ferrari. These existed in various versions. 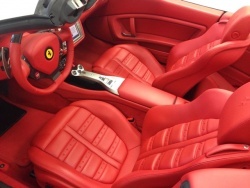 The red seats belong to a Ferrari California from 2013. 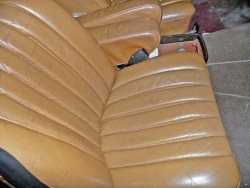 Left: Ferrari leather seats. 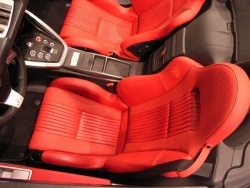 - Right: Ferrari Mondial. 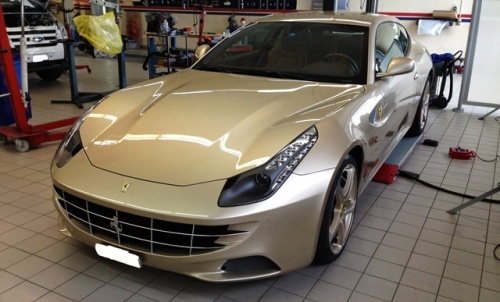 Ferrari FF with Semi-aniline leather. 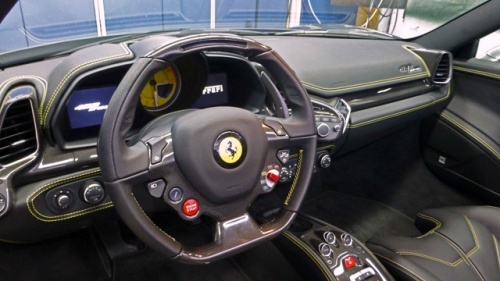 Ferrari F430 F1 from 2008 with unusual seam decoration (from www.motion-drive-vermietung.de car rental). 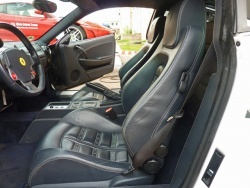 Ferrari F430 F1 from 2006 with Daytona seats (from www.motion-drive-vermietung.de car rental). 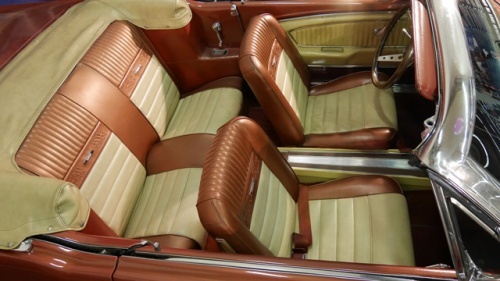 The Ford Mustang in the typical synthetic leather look of car interiors found in the USA with embossing. 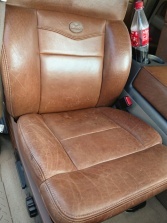 Odd one out: Aniline leather in the Ford F150 King Ranch. 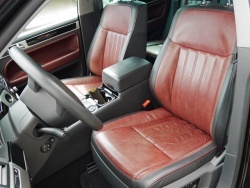 Aniline leather was processed in the first models from 2001 of the luxury pickup F150 King Ranch. 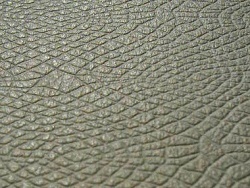 Today's models however consist of pigmented leather. 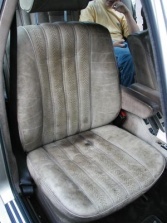 Aniline leather in cars is rare. 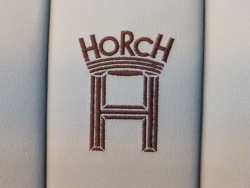 The leather in the Horch is noble. Colourful piping and logo embroidery. 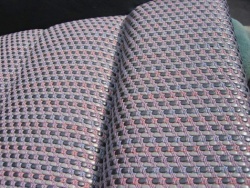 Diamond stitching as a design element. 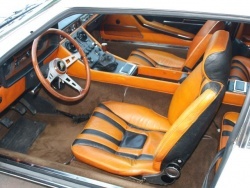 A colourful Lamborghini Espada from 1970. 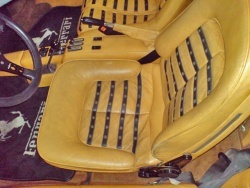 Lamborghini Jalpa 350 from 1981 to 1988. 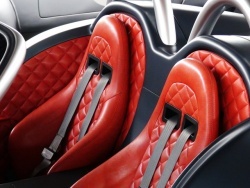 - Blue seats with red piping. A beautiful Lamborghini Gallardo Nera from Motion Drive from 2008 (Motion Drive Car Rental). 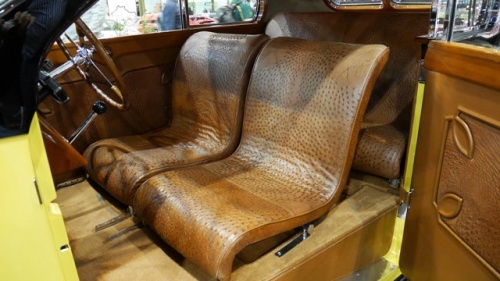 One of the most beautiful leather works ever seen: Braided leather in a Lancia Astura 4th Series Pinin Farina convertible from 1939. 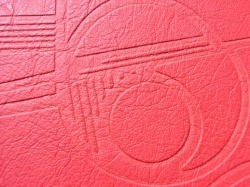 A design artwork: Braided leather. 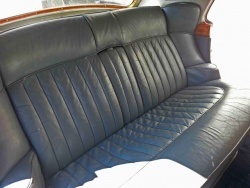 Mercedes has a very long tradition in leather upholstery. 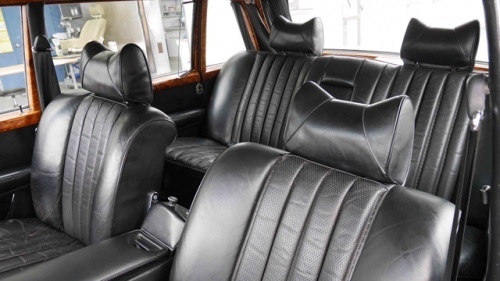 The Mercedes leather is regarded as high quality and durable. All details cannot be shown. 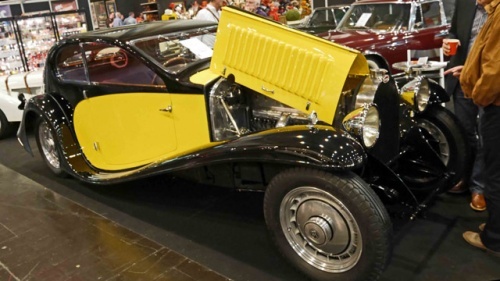 But every classic car collector who has the Mercedes brand with an eye, knows the famous embossing from Mercedes called Mercedes Basketweave. 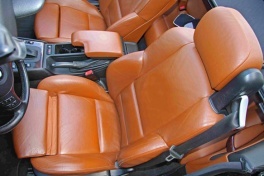 In vehicles of Mercedes the following types of leather are processed: Classic, Catania, Designo (special equipment, one or more colours, mostly strikingly coloured), Lugano, Monza or Nappa. 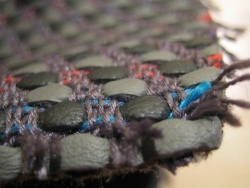 Picture 1: Mercedes Basketweave is embossed. 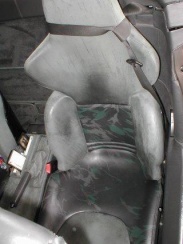 - Picture 2: Mercedes SL129 from 1995 with an unusual perforation. 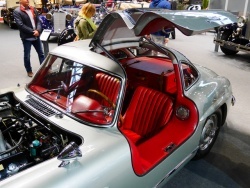 The Mercedes 300 SL Gullwing was originally a car with fabric seats. 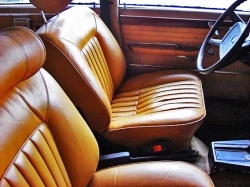 But most of the vehicle seats were changed to leather. 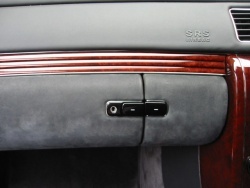 Striking are the wide, leather-covered door sills. 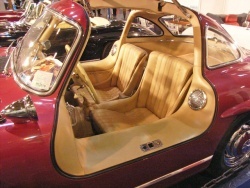 Popular among classic car collectors and priceless: The gullwing - original with fabric seats. 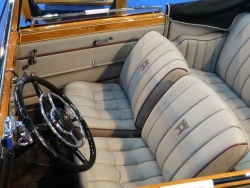 The Mercedes Maybach has interior versions, where the dashboard and panels are covered with nubuck. 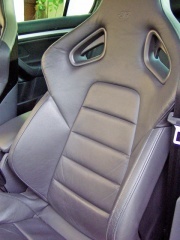 Otherwise this type of leather is only being used in the Z1 from BMW. 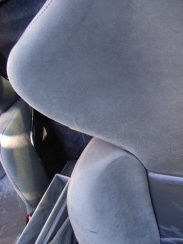 Nubuck is a sensitive leather and therefore rare in cars. 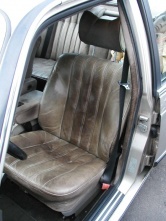 Picture 1: Nubuck dashboard in a Maybach (key area). - Picture 2: Nubuck also the at the glove compartment. 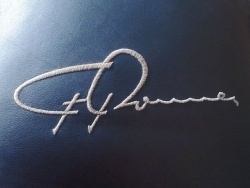 Mercedes also has a tradition in artificial leather. 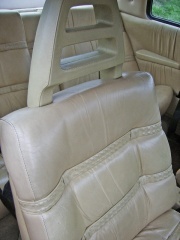 The MB-Tex (now Artico) has a good reputation and has been proven to be robust in taxis for generations. 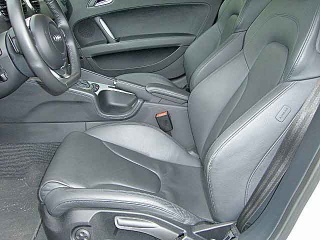 The interior version "Twin" from Mercedes is a combination of real leather and imitation leather. 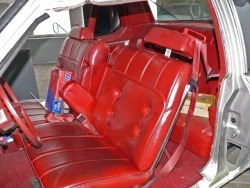 Often in the front seats, the seat and backrest areas made of leather, but the flanks and the rear seats are completely made of synthetic leather. 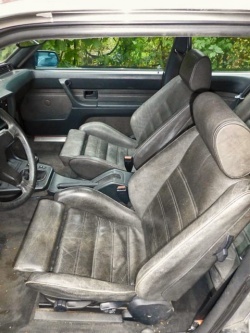 This trim level is cheaper than full leather. 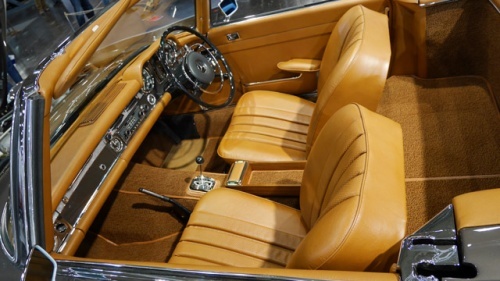 Mercedes 280 SL Pagode from 1969 with seats made of synthetic leather MB-Tex, offered on the classic car show in Essen in 2014 for 84,900 €. 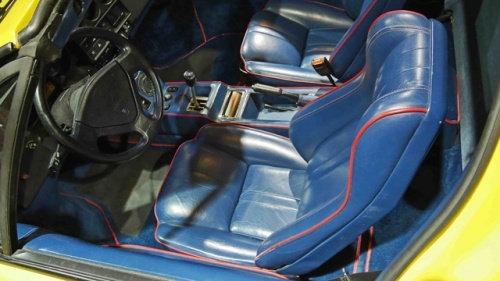 Picture 1: Mercedes-300-SL-R-107-1988 with MB-TEX interior. 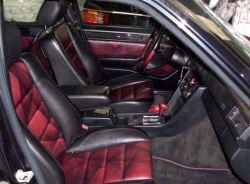 - Picture 2: Mercedes Artiko - imitation leather interior. 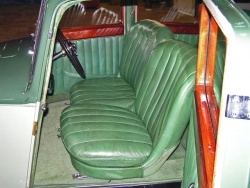 A special series of Mercedes had a particular pattern in the colouring. This variant is rare. 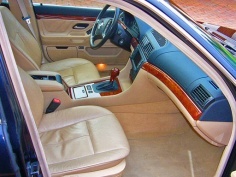 Mercedes E500 Limited with an unusual design. Available in grey, green and red. 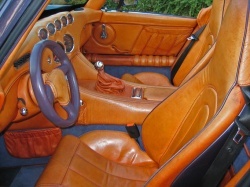 The so-called "cognac 2-tone" or "nature-antique". Typical are the red dots that fade with time. 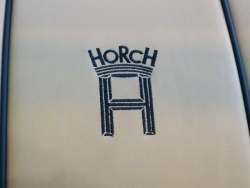 The two-colour effect is clearly visible. The reddish points disappear over the years. 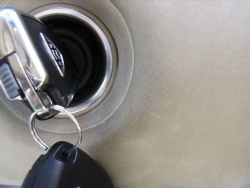 The later copies are not identical to the original and are available in various versions. 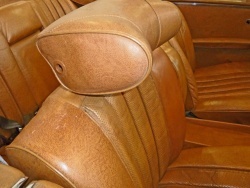 The connoisseurs of historic vehicles immediately detect it: Braided Mercedes leather grab handle. 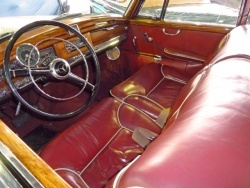 Mercedes with patina and charm. 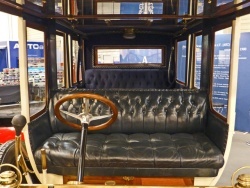 Mercedes Ponton - The British living room. 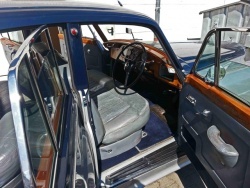 Mercedes 300D Adenauer from 1958 with lots of charm and a beautiful patina. 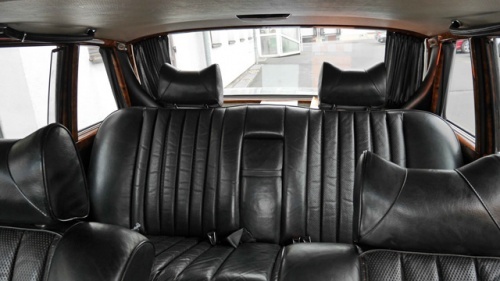 The Mercedes-Benz 600 (W 100) was a representational vehicle in the 1960s and 1970s. 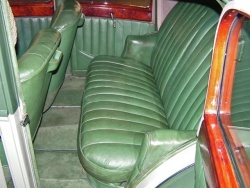 The seats are beautifully soft and comfortable. 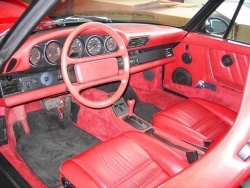 Porsche is known for sporty leather interiors. 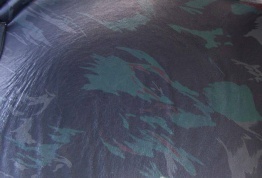 For a Porsche 911 about 5 hides are processed. 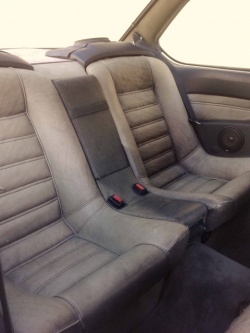 In the Porsche Carrera about 3/4 of the interior is leather, in the less expensive Boxster about 1/3. 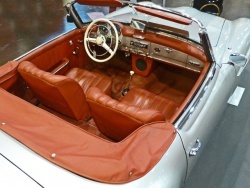 Porsche 356 Speedster from the 50s. 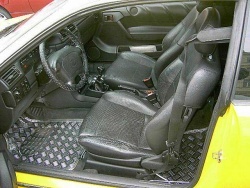 Picture 1: Porsche Carrera 4 from 2000. 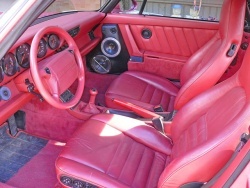 - Picture 2: Porsche 964. 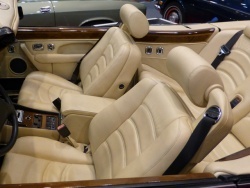 - Picture 3: Porsche Convertible. 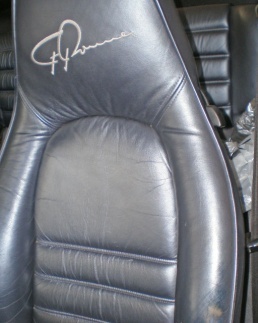 Pictures 1 - 3: Special model with metallic leather and embroidery. 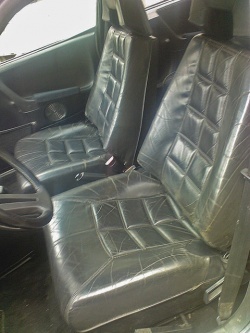 - Picture 3: A combination of different metallic leather. 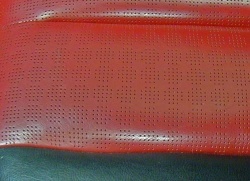 Leather strap closure for bonnet. 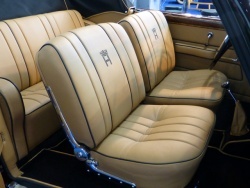 Rolls-Royce, the living room in leather. 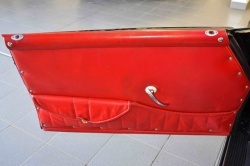 Rolls Royce Corniche (red, from 1983) with contrasting piping. 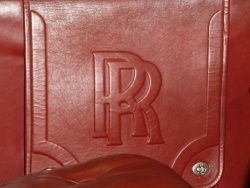 Ancient Rolls-Royce with logo - embossing. VW with colourful golf tournament. 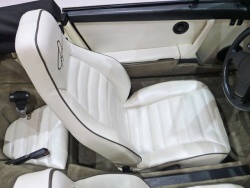 Picture 1: Golf I cabriolet. - Picture 2: Golf from 1997. - Picture 3: Golf "Aigner. - Picture 4: Golf. - Picture 5: Golf III GTI Colour Concept. - Picture 6: Golf V R32. 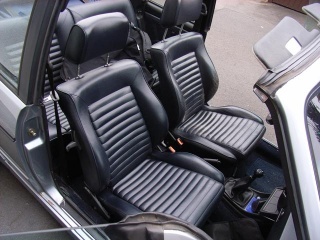 - Picture 7: Golf IV with Recaro full leather trim. 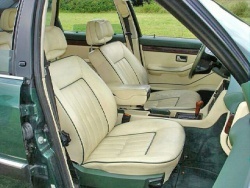 The Touareg "Individual": The Individual interior of the Touareg is a mix of pigmented and semi-aniline leather. There were different color variations. 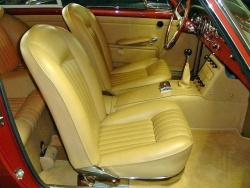 The light brown variant was the most frequently purchased. 70 thousand kilometres on the odometer and still very nice condition, because of good care. 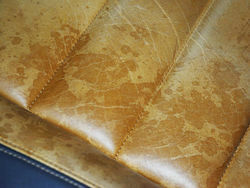 The disadvantage of porous leather: Rain drops and liquids cause stains that can not be easily cleaned. 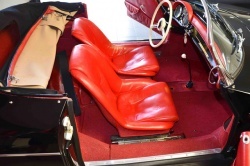 The original Beetle was mostly in fabric or imitation leather. 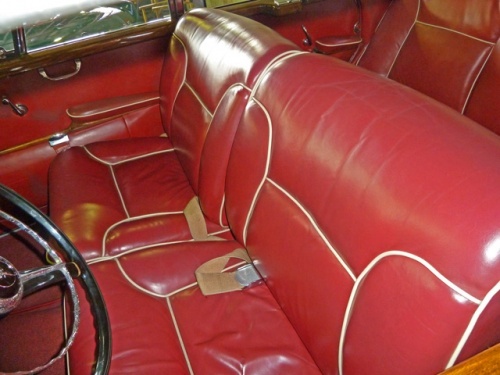 Many lovers of this widespread vintage car upgrade to leather. 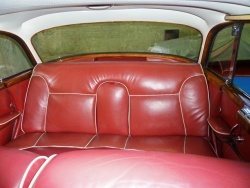 Collector Beetle with leather interior with contrasting piping. Volvo with its own design. Volvo Coupe Bertone from 1991. 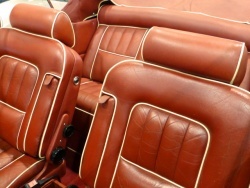 Phenomenal aniline leather interior. 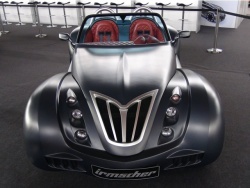 - Wiesmann logo. 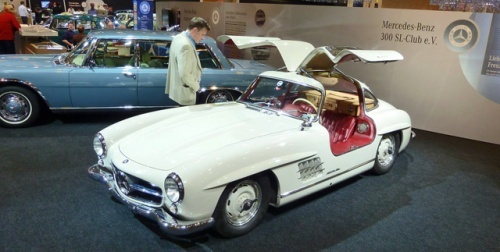 Classic car shows: Classic & Sportscar Show Alexandra Palace London 2015 - Techno-Classica in Essen (Germany) 2011 - Retro Classics Stuttgart (Germany) 2013.